Glamour Girl Gift Guide: 25 Holiday Gifts for Her Under $25! – Style Dr.
Glamour Girl Gift Guide: 25 Holiday Gifts for Her Under $25! Happy Holidays! Can you believe that Christmas is only 19 days away? Why not get the perfect gifts for the Glamour Girl in your life! Even better, all of the gifts (2 are just a few dollars over) are under $25! Imagine that! A glamour girl knows that style has no price! Enjoy a number of gifts that I hand-selected just for you! Happy Shopping! The Lips Toiletry Cosmetics Makeup Waterproof Bag is full-on adorable & glamorous! Imagine filling the bag up with fun girlie items: makeup, sunglasses, pens/pencils…you decide! 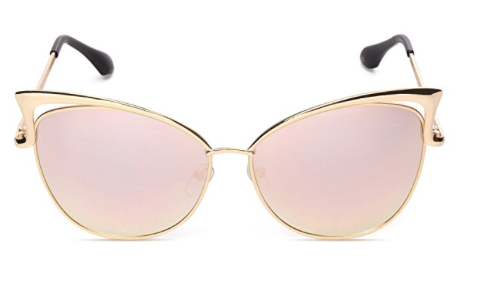 The Oversized Cat Eye Sunglasses Mirror Eyewear With Case is full on glamour with the gold/pink lenses! MEOW! 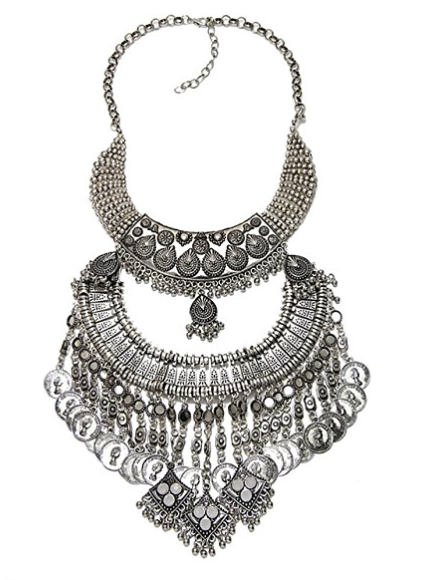 The Bohemia Silver Tone Long Boho Statement Necklace with Coin Tassel is glamorous! Imagine the surprise & gasps of the lucky recipient of this gorgeous statement necklace…fabulous! If you like the style, yet prefer a smaller necklace, why not try the Gypsy Bohemian Vintage Silver Coin Turkish Beachy Bib Statement Necklace! 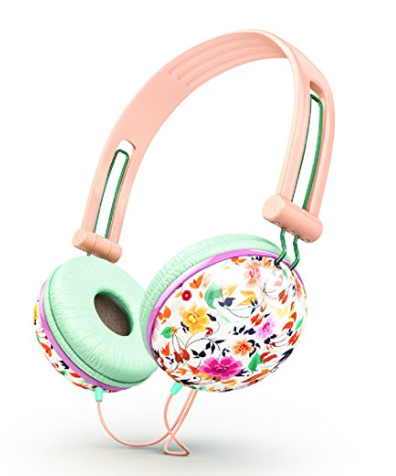 The Ankit Pastel Peach Pink Floral Noise Isolating Headphones are super girlie! Okay, so maybe they are $4 over the amount you had in mind, but they’re so worth it! The headphones are irresistibly cute! The metallic black & gold headphones are amazing as well! 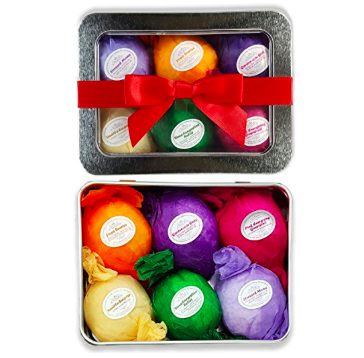 The 6 Vegan Bath Bomb Fizzies Essential Oil Gift Set will be a colorful treat that will also delight the senses with a variety of fragrances! Imagine the yummy scents: RELAXATION (Lavender) , DETOX (Vanilla) , ENERGIZE (Grapefruit), DE-STRESS, SINUS (Peppermint), CONGESTION RELIEF (Eucalyptus)! The Voluspa French Cade & Lavender Limited JAPONICA 3 Wick Candle in Decorative Tin is two gifts in one! You get the gorgeous scented candle & once the candle has finished burning, why not keep the gorgeous tin to put fun keepsakes inside! The Primula Half-Moon Teapot Flowering Tea Set – 40 oz. – Clear Glass with Black Accents – Includes 3 Flowering Teas! What a fun gift that allows you to see the flower teas blossoms through the see-thru glass, a complete “Wow” moment! Why not add additional flowers balls; HuntGold 10ps a pack Random Chinese Green Artistic Blooming Flowering Flower Tea Balls! The Peter Pauper Press Bordeaux Journal, Japanese Screen Journal & Celestial Journal are beautiful & make a unique diary to write down your thoughts, to-do list or creative writing! The Bath And Body Works A Thousand Wishes Trio Body Lotion smells divine! I have this scent & it’s pure perfection! Why not try other gift sets: Bath & Body Works A Beautiful Day , Bath & Body Works Moonlight Path Gift Set or why not get Bath & Body Works Signature Collection Winter 2016 Frosted Coconut Snowball, which I fell in love with the minute I sprayed it on at the store & had to have it…a very tropical yet christmas scent wrapped into one! I love it! 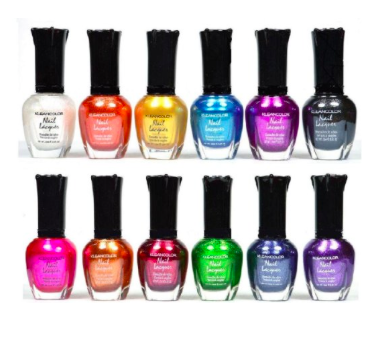 The Kleancolor Nail Polish – Awesome Metallic Full Size Lacquer Lot of 12-pc Set is a unique set, especially fun to wear for the holidays! It also reminds me of chrome nails, which I will be trying for the first time before heading off to my family vacation! Perhaps you prefer the Kleancolor NEON 12 Full Collection Set Nail Polish which has standout colors or the Pastel Nail Polish Gift Set, very posh candy colors! The Pink Rose Cat Ears Headband & Black Lace Cat Ears Headband make the perfect gift duo & unique twist on headbands! 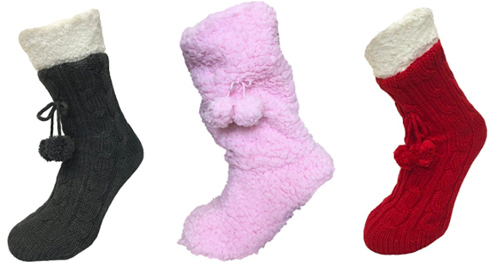 The comfy Sherpa Fleece Slipper Booties with Gripper Sole and Pom Poms are so fluffy and cozy, also comes in the colors: Foxbury Grey, Pink, & Red! The Satin & Lace Pajama Cami Set is adorable and I love the side of the tap pants, such a glamorous set! How cute is the Satin Pajamas, Long Button-Down Pj Set and Mask, which comes in a variety of vibrant colors! 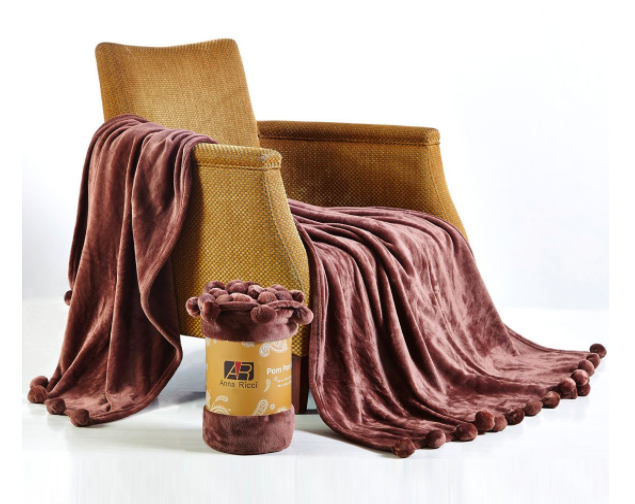 That’s a 3 in one gift set that will have you lounging in luxury! Imagine the Pom Plush Throw Blanket wrapped around your body as you snuggle against it, keeping cozy warm while you relax…perfect! 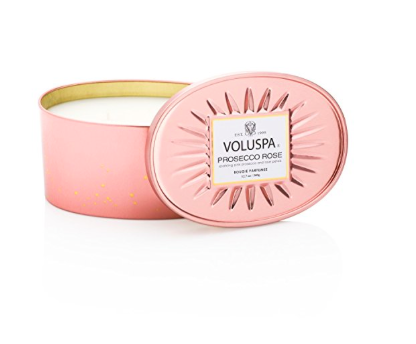 The Voluspa Prosecco Rose 2 Wick Candle In Decor Oval Tin 12.7 oz not only smells decadent, but you also get to keep the pretty tin to put your favorite keepsakes inside…rings, bracelets…! 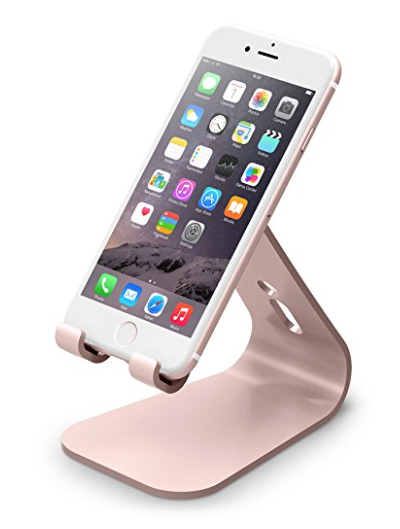 The Rose Gold Smart Phone Stand is amazing! You will be hands free and you can even turn it sideways, which makes things so much easier when you’re on a video call! 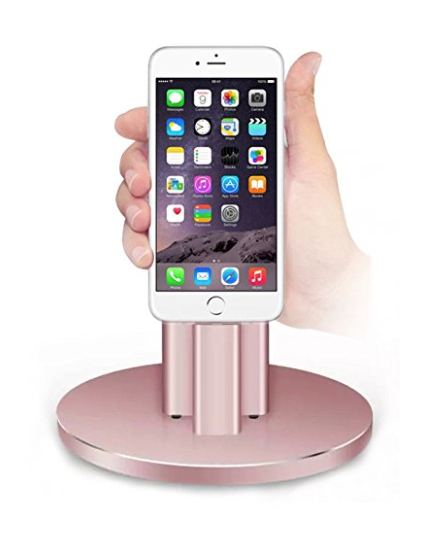 The Adjustable Smart Phone Charging Dock Stand is pretty as well! 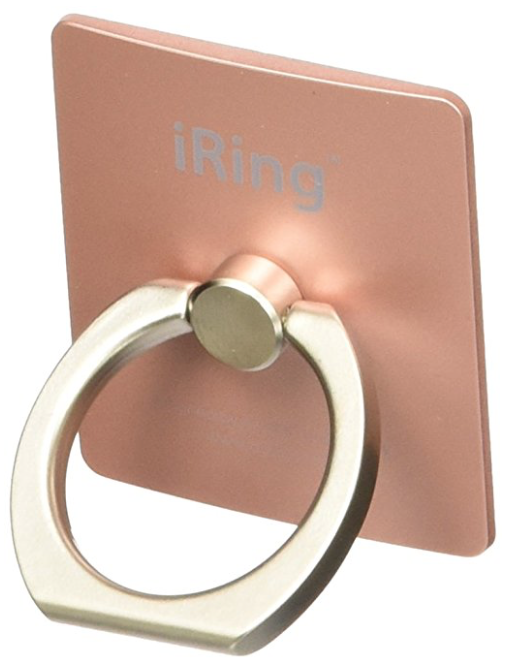 The iRing Hook Black The Safe Grips And Cradle is the perfect adhesive to keep on your phone so that you keep a tight grip, as you slip your finger through the ring! Plus, it’s so shiny! How cool are these Adult Fashion Coloring Books?! Why not sit back, relax, and let your mind wonder as you color in style! Haha! 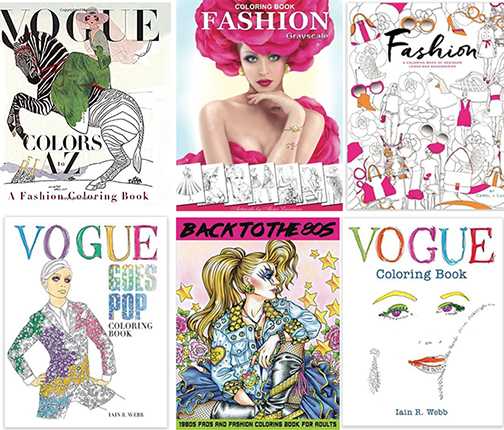 Second Row: Vogue Goes Pop Coloring Book, Back to the 80s: 1980s Fads and Fashion Coloring Book & Vogue Coloring Book! Note: Why not add-on the Sargent Art Premium Coloring Pencils, Pack of 50 Assorted Colors! The Soap And Glory Clean Getaway Gift Set 4 Mini Best Sellers is a winner! Not only is the scent delightfully fresh & clean, but I was given this set as part of a gift! I loved the Soap & Glory products so much that I ended up ordering the full size versions! Score! A gift set is a great way to share your favorite products with your friends & makes a great gift! 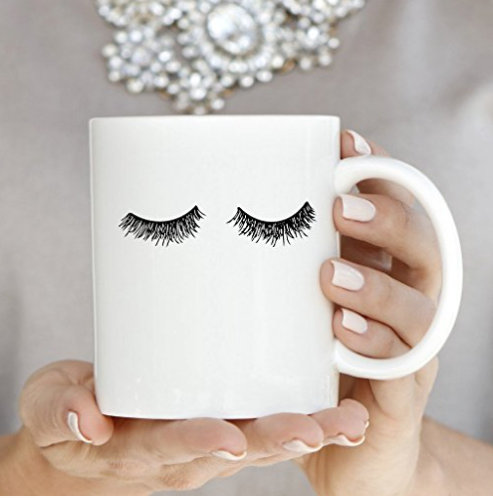 The Eyelashes Coffee / Tea Mug had me at hello, so cute! A glamour girl knows that mascara or false lashes are a must! The mug is also available in pink! 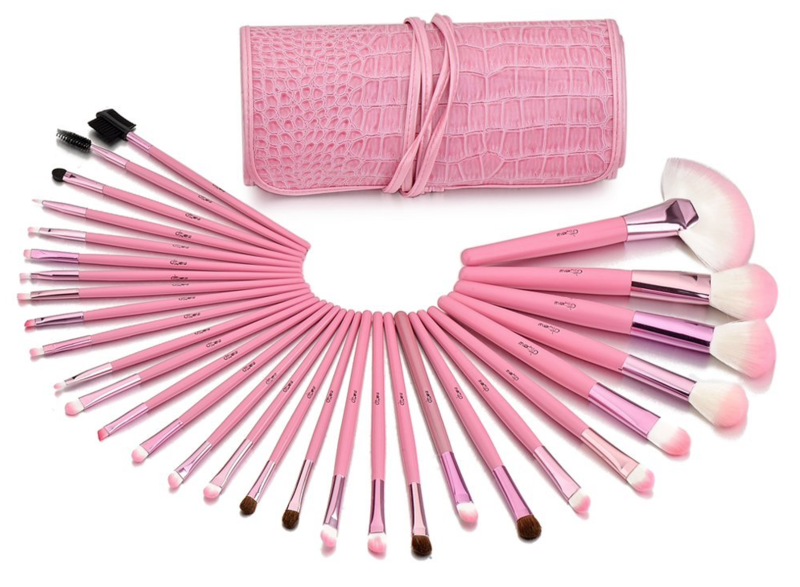 The Glow 30 Pc Professional Wooden Handle Make up Brushes Set in Pink Case by Jennifer Lopez, so pretty in pink! 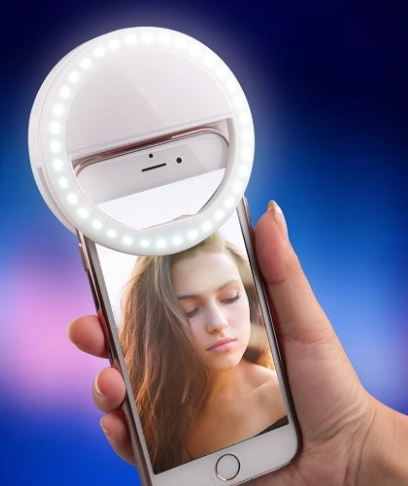 The Ring Light for Camera [Rechargable Battery]Selfie LED Camera Light will make sure each selfie is well lit! You glow girl! 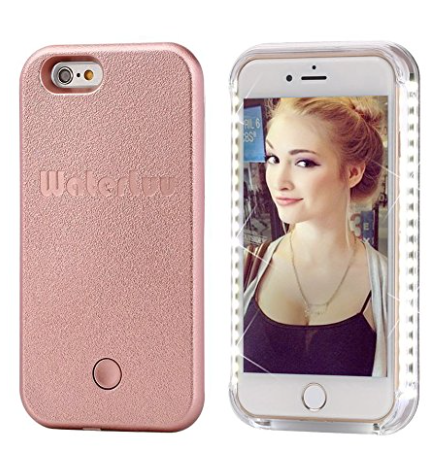 The WaterLuu® LED Illuminated Phone Case is perfect for selfies, so bright that you can light up the room…with your dazzling smile of course! You also have the option of 5 different light settings! Every glamour girl appreciates a picture perfect moment & as you know, it’s all about lighting…it’s the details that count! Lights, camera…pose! Happy Holidays & See you next time! ‹ PreviousUgly Sweater 5K Charity Run: Ugly Christmas Sweaters! Next ›Stuart Weitzman Over The Knee Highland Suede Boots & Dupes!